Shawn Patrick Cooke fills his time by solving Rubik's cubes, ballroom dancing, learning languages, and generally getting distracted by the next shiny new hobby. His fiction reflects that variety of interests, stretching from historical fiction to his own invented worlds. While in our universe, Shawn lives in Richmond, Virginia, with his wife, his daughter, his cat, and his books. 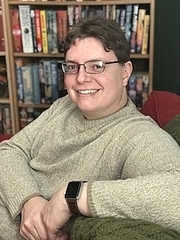 Shawn Patrick Cooke is currently considered a "single author." If one or more works are by a distinct, homonymous authors, go ahead and split the author. Shawn Patrick Cooke is composed of 1 name.